Sydney and Melbourne have been named in the world’s least affordable cities to buy a home, with the average household requiring spending of up to 12 times their annual income. 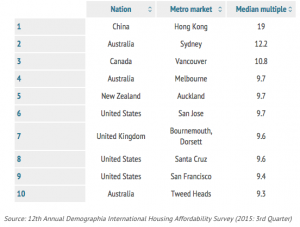 Just behind Hong Kong, where the average household expects to spend 19 times their average annual income on home purchases, Sydney comes in second with spending averaging at 12.2 times, up 2.4 points from 2014. Melbourne settled into an equal fourth place with spending recorded at 9.7 times. Despite this lack of affordability, Australian home loan repayments are said to be at average levels, with mortgage defaults are currently at a record low across both Melbourne and Sydney. What the study failed to recognise when assessing the least affordable cities globally was the differences in income taxes, geography, employment constraints and demographics of any given area, which would affect the pricing of properties. In saying this however, it is important to note that new home owners’ are paying an extraordinarily large percentage of their income on purchasing houses, and renters are paying excessive costs as a result of this.